Say goodbye to sticky rice, undercooked rice, or dry, overcooked rice: With the right technique—blog post shows how easy it is—cooking rice perfectly is a snap. The basic recipe is 2 to 1, in terms of water and rice. You can easily, double and even triple the recipe; just make sure you are using a pot large enough to hold the rice as it cooks and expands. Other rice varieties, like brown and Arborio, can be a little different in terms or proportions and timing, but this is how you’ll get perfect white rice every time. Rice keeps well in the refrigerator for up to 5 days so you can make extra to serve later in the week, or to use in different dishes. Pour water (for every cup of rice, use 1 ³/₄ cups of water) into a large saucepan with a tight-fitting lid. Bring to a boil. Mix 1 teaspoon salt into the water. Use a wooden spoon to separate any clumps. Don’t over-stir: That can cause the rice to become sticky. Be sure the lid fits tightly on the pot. Turn down the heat to its lowest setting. Let rice simmer for about 18 minutes, then remove from heat and allow the rice to steam in the pot for another 5 minutes. Just before serving, gently fluff the rice with a fork to separate the grains. 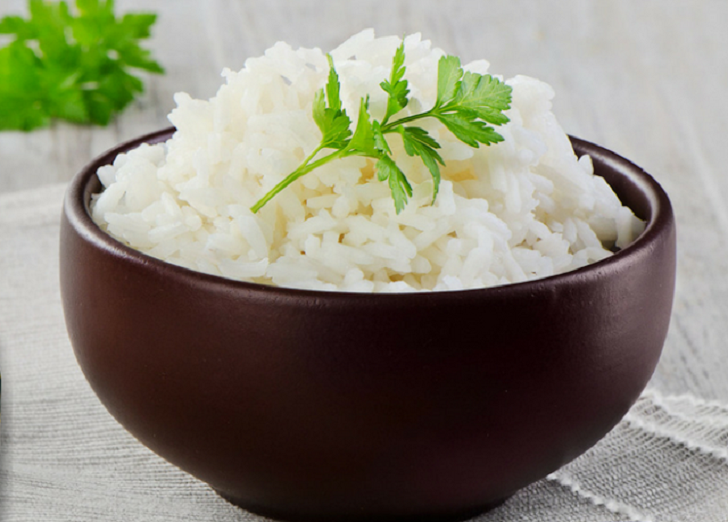 Recipe Tip: Don’t uncover the saucepan or stir the rice during cooking. If it’s done before you’re ready to serve it, place a folded towel over the saucepan, replace the lid, and set aside. The towel will absorb excess moisture and condensation, helping prevent overcooked and mushy rice.